Transformed from sea to sandy and soggy reclaimed land to some of the best-known gardens in the world, Gardens by the Bay are a phenomenon. Although Gardens by the Bay covers just over 100ha, it is its domes which hog the limelight. The Flower Dome has big baobab trees, amid more than 1000 plants from desert regions from Madagascar to Mexico, South America to Africa. The biggest glasshouse in the world, the Flower Dome also has Australian grass trees and ancient olive trees from the Mediterranean — one estimated to be more than 1000 years old and so successfully transplanted it has blossomed and borne fruit. A baobab inside the Flower Dome. Old olive tree inside the Flower Dome. Cacti inside the Flower Dome. Most visitors will then continue into the Cloud Forest dome. Ferns, orchids and pitcher plants cover the mountain, from which pours a 35m waterfall — the world’s biggest indoors. Visitors can then complete the Cloud Walk and Treetop Walk, all within the dome. But a good trick is to time a visit for the mistings at 10am, noon, 2pm, 4pm, 6pm and 8pm. This is when mist is released, giving a true feel of the natural environment they represent. The domes are chilled to between 23C and 25C. Roman Emperor Tiberius built the world’s first greenhouse in 30AD. We might just consider what he’d make of all this. Entry to the two domes is $S28 (also $28) for an adult and $S15 for the over-60s. To walk the OCBC Skyway 22m above the ground, giving a good view of the Supertrees, gardens and Marina Bay beyond, is S$8. The domes and skyway are open from 9am-9pm. Green wall in the Cloud Forest. Misting time in the Cloud Forest. Green wall and waterfall inside the Cloud Forest. But visitors are free to wander, for free, in the outside gardens. And it’s good to step away from the manufactured bliss of the domes and into, well, a more real world. There are the Heritage Gardens, World of Plants and the two lakes, Dragonfly and Kingfisher. And there’s the Supertree Grove, with man-made trees towering 16 storeys. The Supertrees fulfil important roles. One is the air exhaust for the two conservatories (mimicking the actions of natural trees) and 11 have solar photovoltaic cells in their “canopies” to capture solar energy. They have healthy vertical gardens of an estimated 160,000 epiphytes — ferns, orchids, vines and bromeliads. The outdoor gardens are open from 5am-2am and are nice for an evening walk. In these quiet moments of strolling reflection, I think of Singaporean botanist Dr Kiat W Tan. 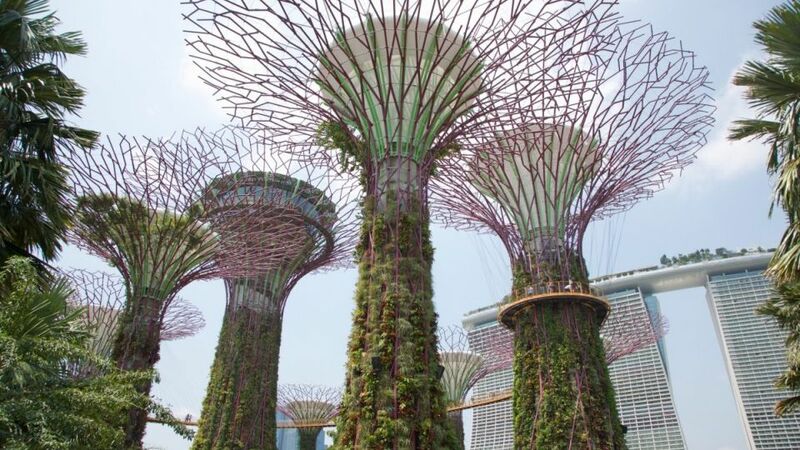 For it was he who first had the thought of creating Gardens by the Bay, and it was he who led a team of international and local specialists for five years, turning this from sea to sandy and soggy reclaimed land, and the phenomenon which opened in 2012. He retired from his position as chief executive of Gardens by the Bay in February, aged 75. He said, very simply, that he had just created a place where people could see flowers — a million of them, here, in some of the world’s best known gardens, already seen by more than 40 million people. Singapore is a tiny, highly populated island state but it isn’t all concrete. Since the first public tree-planting in 1963, it has been committed to becoming a “city in a garden”. Another key figure in this is Dr Chua Sian Eng, who became Commissioner of the Parks and Recreation Department in 1983. He led an aggressive campaign of planting and developing parks. The then prime minister Lee Kuan Yew wanted shade trees to give pedestrians cool places to walk, and parks for families and children, for weekend recreation. The National Parks Board, known as NParks, also embarked on projects like the conservation of mangroves at Pasir Ris. About 3318ha of Singapore’s land is given to parks, park connectors and open spaces. Of these, nearly 80 per cent — more than 300 parks — come under NParks. Keep in mind that the Singapore Botanic Gardens — different from Gardens by the Bay — are an integral part of Singapore’s heritage, covering 63ha near the city centre. It has outstanding plant collections. Its herbarium and library collections, of more than 600,000 dried and preserved specimens, provide an important reference resource on the region’s flora for botanists around the world. And there’s been a very specific wordplay in all this. Somewhere along the line, the rhetoric was consciously shifted from aiming to be a “garden city” to being committed to become a “city in a garden”.